The Love Factory campaign is part of a wider Fiesta marketing drive. 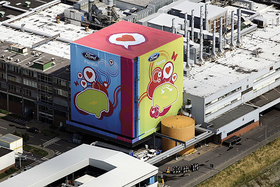 Pictured is the in-line vehicle sequencing tower at Fords Cologne plant, where the Love Factory images can be seen from the air. COLOGNE -- Welcome to the Love Factory. Thats the name Ford of Europe has given to its factory in Cologne, Germany, after claiming workers were in love with the latest Fiesta to be built here. The site, next to the Rhine River, was transformed with colorful paint as part of the marketing blitz for the small-segment car, which was launched in the middle of last year. But beneath the fancy painting and marketing hype, a lot of work and money has gone into making Cologne one of the most efficient car factories in Europe. It has to be -- to make a small car profitably in a high-cost country such as Germany, a factory has to be very cost effective. Cologne is one of the most efficient factories in Europe, according to a confidential Harbour Report, which analyzes automotive factory efficiency for the industry only. That report, published in the German magazine Capital, said it takes 12 hours to produce each Fiesta small car, second only to the 11.3 hours that it takes Nissan workers to produce the Micra minicar in Sunderland, England. "If we stopped, the others would catch up with us. 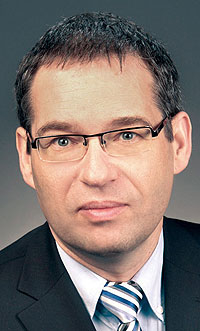 So we have to keep improving," said Karl Anton, Ford Cologne plant manager. Ford declined to confirm Harbours findings, but Karl Anton, the Cologne plant operations manager, said production of the new Fiesta is more efficient than its predecessor. The factory was recently honored with a Manufacturing Excellence Award from the Technical University of Berlin. Anton said: We can be very proud that we are three times more efficient than a factory in eastern Europe, but our wages are more. The big change came in 2000 when there was a total overhaul of the factory. This saw increased automation and the establishment of a supplier park 800 meters from final assembly, as well as the adoption of lean techniques. These improvements were further refined when 455 million was spent preparing the factory for the new Fiesta. -- Tapping into the collective knowledge of the work force. In some cases low-tech solutions have reduced the need for high-tech machinery. A so-called happy chair has been invented to allow workers on the final trim line to get quick and easy access to the inside of the cars to install control panels and other components. If you increase automation, if you are building more than 1,000 cars a day over time you need to factor in stoppages, that reduces your line speed, said Anton. Because of innovations like this, the Cologne factory has been able to increase its output without increasing its staff numbers. Output has risen from 257,000 units in 2002, when 5,196 employees worked at the plant to more than 411,000 with a little more than 4,000 employees in 2007. There is constant pressure to improve -- which helps to keep the factory operating in the face of ever-increasing cost pressures.